We offer patient identification bands. 1.) Made of soft PVC film, which does not harm to the skin. 3.) Size : infant/pediatric (small), adult (large), mother-baby. Patient ID bands are an important way to reduce patient safety risks. Patient misidentification continues to result in medication errors, transfusion errors, testing errors, wrong person procedures, and the discharge of infants to the wrong families. Today, with hundreds and thousands of patients being admitted and discharged from hospitals and nursing homes every day; identification of patient using wristbands is an integral component of smooth running and helps minimize medical errors and administrative issues can be handled efficiently. ORIGIN offers optimal and secure patient identification solutions for healthcare facilities. 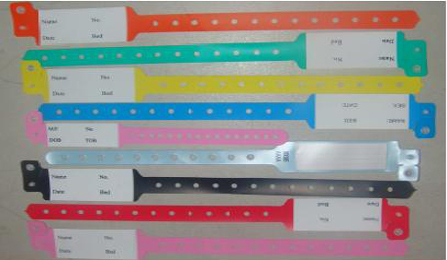 Colour coding of wristbands facilitates rapid visual recognition of specific issues and can be modified as per the requirement of the organization. We offer Patient Identification solutions for admissions, blood, mother and baby, pediatrics, disaster response, outpatient and emergency room purposes.